I had an revelation Friday about the Internet and especially Twitter as the tweets about that day's NATO bombing of Tripoli came in. The first ones noted large explosions but didn't know how they had been delivered. 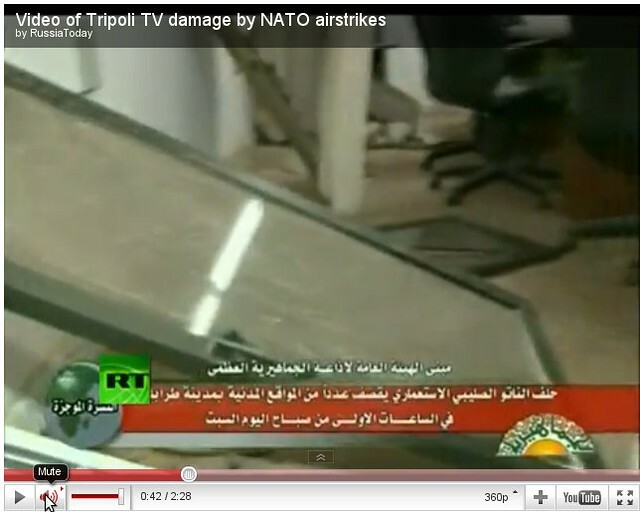 and still others claimed that the target appeared to be Libyan State TV. #Nato says it has disabled three Libyan state TV satellite transmission dishes in the capital, #Tripoli, through a precision air strike. As I read these coming in, in real time, I realized that because of this technology, neither NATO nor anyone else could bomb a city without the world knowing within minutes. The Nixon era secret bombings of Cambodia were truly a thing of the past.. .as long as we keep the Internet free. The pro-Qaddafi PressTV was one of the first to break the story outside of Twitter with the headline NATO airstrikes hit Tripoli city center. The way they told it, you would think all of downtown Tripoli had been bombed. According to NATO they took out three satellite antennas for Libya State TV "with the intent of degrading Qadhafi’s use of satellite television as a means to intimidate the Libyan people and incite acts of violence against them." They also said "Striking specifically these critical satellite dishes will reduce the regime’s ability to oppress civilians while at the same time preserve television broadcast infrastructure that will be needed after the conflict." According to this source the strike was carried out by RAF Tornado and Typhoon aircraft. There was also another series tweets which I mysteriously can't seem to find now but remembers seeing in the Twitter bomb damage assessment after the strike. One was a series of tweets from someone calling himself navyguy something or other saying that NATO needed engineering drawings and other specific intelligence about Libya State TV. Another was a tweet claiming to carry the co-ordinates of a fourth satellite uplink antenna. Curious, is Twitter really being used to request and deliver target information? "Three of our colleagues were murdered and 15 injured while performing their professional duties as Libyan journalists. NATO admitted the crime citing "silencing Gaddafi propaganda machine" as a justification for such murderous act. We are the employees of the official Libyan TV. 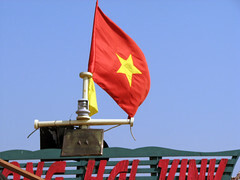 We are not a military target." This video is interesting both for what it does show and what it doesn't show. It doesn't show where the bombs actually hit. We don't see the impact site or any fire damage and blacken soot we associate with explosives. We don't see any dead or injured or the sites where they have supposedly been killed or injured. 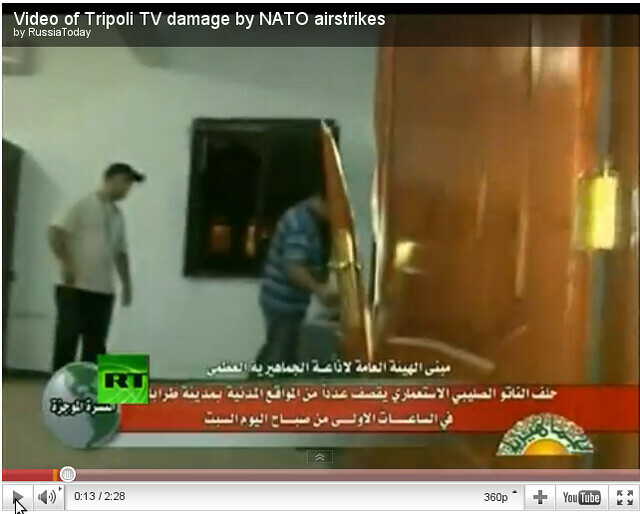 This is an interior door that we are suppose to believe was damaged by the NATO attack. Did NATO attack by having very burly guys bust through office doors without opening them first? Because that is what it looks like to me. There is no bomb or shrapnel damage to the beautiful wood finish of the door, not even a trace of soot. This wood has been damaged by a relatively slow impact, like being rammed, not by the extremely rapid shock and small particle spray of a modern bomb blast. 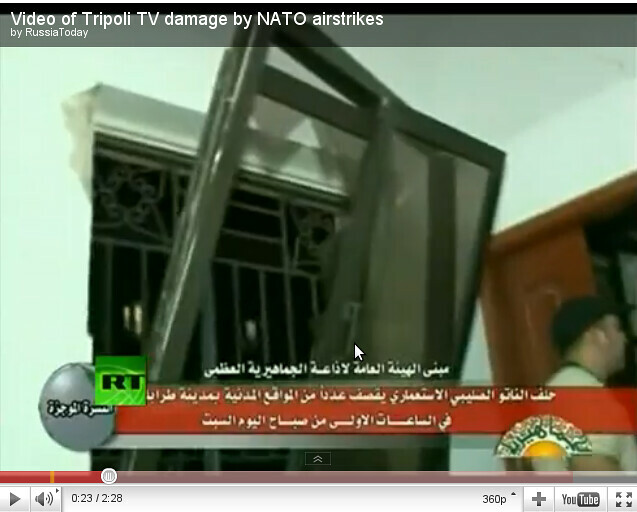 NATO bombs apparently knocked this window out of the wall and onto the floor. Fortunately for all, it wasn't even cracked. Other sections of the video show empty rooms and a conference room where the suspended ceiling has come down, making an absolute mess everywhere. The building roofs and real ceilings appear to have escaped the blast. Now I know NATO used smart bombs for this attack but just how smart are they? Do they fall to the ground and then turn themselves into burly men who then ago around and sack everything? Because the scenes in this video remind me more of earthquake damage and any real bomb damage I have seen. We certainly know that NATO has killed Libyan civilians in their strikes, they have admitted as much, but all the circumstances surrounding this strike and the quality of the proof offered by the Qaddafi government make it very hard to take at face value their claims that 3 technicians were killed in the strike on three satellite disks. The Qaddafi regime has been using some questionable methods to avoid air strikes. For example, they have had their army ditch many of it's military vehicles in favor of pickup trucks so that they look like the freedom fighters. They have even gone so far as to paint the opposition flag on those vehicles. They also often accused NATO is hitting civilian targets and killing innocent people. 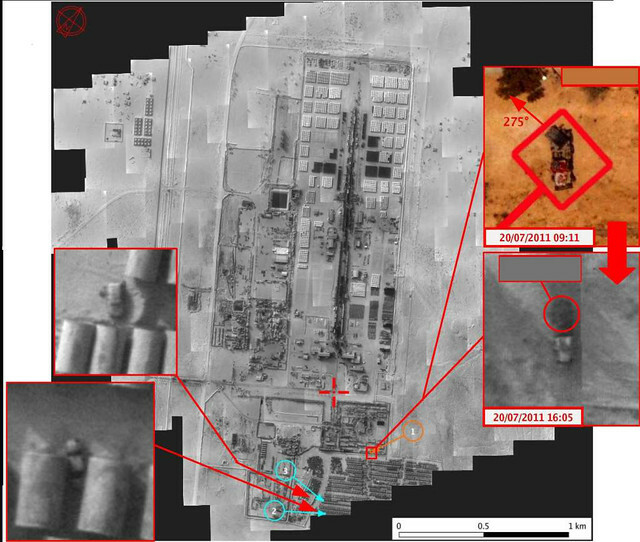 Apart from differences between Qaddafi and NATO over what constitutes a legitimate military target, there is strong evidence to suggest that Qaddafi is misusing civilian locations to hide his military assets. A NATO terrorist attack has hit a water pipes factory in al-Brega, murdering six guards, this being the factory which makes pipes for the great man-made irrigation system across the desert which brings water to seventy per cent of Libyan homes, according to sources in Libya. Although, as usual, no bodies were presented or names released, Pravada called upon the international community to "stop this murderous atrocity, this outrage against civilization and international law, now." Slide one, please. By the way, these pictures will be made available on the NATO site, so it would be possible for the media to download them. So basically repeatedly over the past few weeks we got clear intelligence indicating that pro-Qadhafi forces are using this factory for military purposes. The factory is being used to hide military material, including multiple rocket launchers. These weapons have been used every day from within this factory compound and then carefully hidden after the day, within or along massive concrete pipes that you can see in this picture. Multiple rocket launchers, like the ones in the upper right hand corner insets in this picture and apparently destroyed in this raid, have been used by the Qaddafi forces for the indiscriminate slaughter of people in cities like Misrata. He was doing this before NATO intervened. He is still doing it however he can get away with it now and the so-called anti-interventionists want NATO out of it so that Qaddafi can get back to killing big time without interference. The anti-interventionists never bothered to trouble themselves about the plight of the Libyan people as Qaddafi killed as many as 7,000 before NATO intervention and they have never seriously challenged the proposition that more Libyans were killed in the first four weeks before NATO intervened than in the four month since. In fact, they don't really care about the Libyan people. They just care about opposing the United States no matter what it does and they want NATO out of it. Among other things, this has led to a serious imbalance in the anti-war movement. Yesterday, at a Los Angeles fund raiser for Haiti featuring, Danny Glover ( I gave him a copy of my film, Vietnam: American Holocaust), Pat Alviso of Military Families Speak Out [MFOS] complained to me that she thought the anti-war movement had forgotten all about Iraq and Afghanistan. She reminded me that we still have soldiers on the ground dying in those wars, and I would like to remind everyone that the U.S. is killing a lot more in those conflicts without even the fig leaf of a humanitarian cause. And let me just add for the record today, they apparently don't care about the Syrian people either. If the U.S. opposes Assad's use of tanks in Hama, then they certainly can't. So don't look for statements of opposition to the Syrian crackdown from them, they're waiting for someone to try to stop it. Then they'll swing into action.